Home › Charity › Dress-down day raises £100 for Tenovus Cancer Care & Penyfantimes5 Challenge! At n-ergy, we love a cake-bake in the office so it made sense for us to combine a Best Mountain Themed Cake Competition with our dress-down fundraising event. We are absolutely thrilled with the amount of monies raised from both fundraising activities and extend a massive thank you to our colleagues who gave generously on the day! 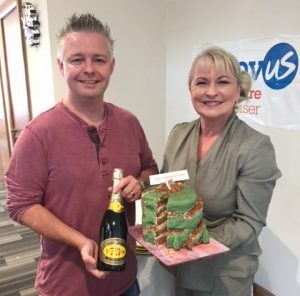 One of our Assessors in our Wales team, Neil Moriarty, was our champion baker and worthy winner with his amazing Penyfan cake entry. Neil won a small prize which was presented by our CE, Donna Turner-Kot who was our bake-off judge; (see photo opposite). Thanks again to everyone for their donations today, no matter how small! 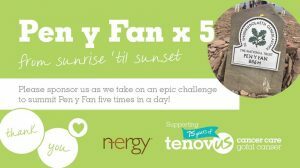 The £100 raised will support the fundraising for n-ergy Penyfantimes5 Challenge taking place on Sunday, 16th September for Tenovus Cancer Care. 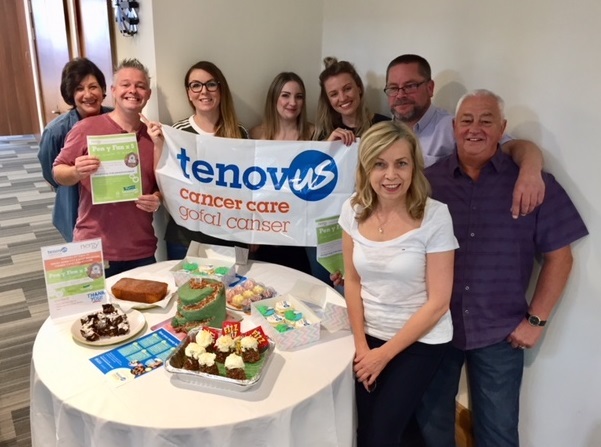 n-ergy proudly supports the amazing work that Tenovus Cancer Care carries out in the local community and also the charity’s cancer researchers to support them to find new ways to prevent, diagnose and treat cancer. To find out more, please visit the website of Tenovus Cancer Care www.tenovuscancercare.org.uk. to follow Ash and Sarah’s mountain climb or climbs (!) in respect of the Penyfantimes5 Challenge in September.